Studies demonstrate that appropriate design has a desirable impact on clinical outcomes and the cost of healthcare buildings. Optimum acoustics can help patients sleep better and reduce stress, aiding patient recovery. Our CPDs receive very positive feedback. Specifiers find them informative and enjoyable. The seminars are presented by an expert member of the Rockfon specification team and can be held at your workplace. We are very proud to have been awarded ‘Recommended Supplier’ to the NHS and social care construction schemes in England by the Department of Health (DH) via its ProCure22 (P22) administered framework. 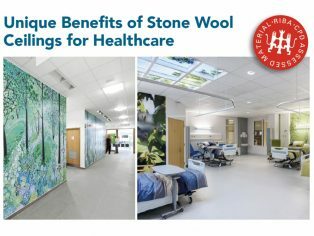 The appointment is proof positive of the trust and belief the DH and NHS have in the professionalism and expertise exhibited by our team and the outstanding quality and performance characteristics of our product ranges. We have been specified on a large number of projects within the healthcare sector over many years. We also provide other RIBA Accredited CPDs. Interior Acoustic Surfaces for Monolithic Architecture explains how it is possible to achieve the elegance of a smooth, seamless ceiling that also offers highest Class A sound absorption. Natural Benefits of using Stone Wool for Acoustic Ceilings and Walls covers the high acoustic performance of stone wool, fire performance, hygiene, exceptional sustainability and low whole life costs. We illustrate their suitability for all applications including education, healthcare, retail, office, leisure and thermal mass areas. For more information and to book your RIBA accredited CPD seminar, please contact us at rockfoncpd(Replace this parenthesis with the @ sign)m-spring.com or phone 0800 389 0314.